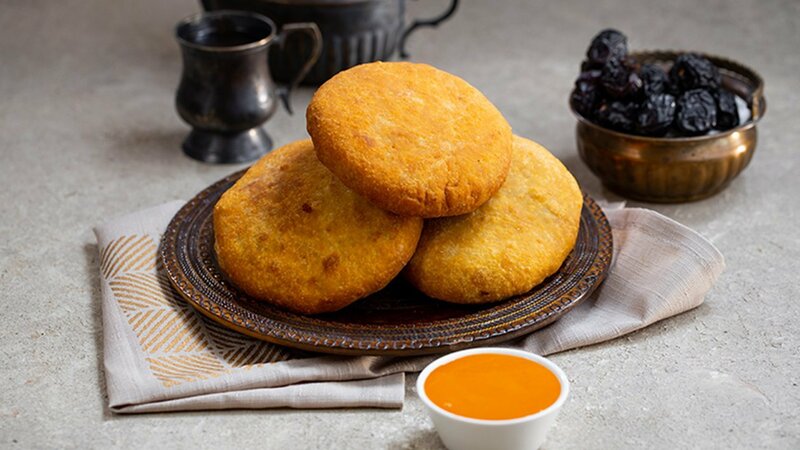 This kachori is simple, crispy and full of flavors! Check the exciting recipe below! Add onion and ginger and sauté for two minutes. Crush coriander seeds and fennel seeds and add to the onions. Add chicken, cumin powder, red chilli powder, garam masala powder, black salt and Knorr Chicken Stock Powder mix well. Continue to sauté till chicken is cooked. Add Knorr Chilli Garlic Sauce. Transfer the mixture into a dish and set aside to cool. When cooled down, add coriander leaves and cheese and mix. Add Knorr Chicken Stock Powder and soda bicarbonate to refined flour and mix. Knead into a stiff dough using enough water. Divide the dough into even sized parts. Using your fingers to spread each dough into a small puri keeping the edges thinner than the center. Place a portion of the stuffing in the center and gather the edges and roll into a ball again. Rest for five to seven minutes, then roll them out lightly. Heat sufficient oil in a pan and deep-fry the kachoris on medium heat till light golden.